Geneva 2012: Ford Tourneo custom concept | What Car? The Ford Tourneo custom concept has been revealed at the 2012 Geneva motor show. 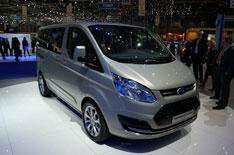 It will be the basis for an all-new family of Ford Transit people movers and commercial vehicles. The Tourneo features an all-new interior design with driver-focused cockpit, and a luxurious new cabin with high-quality materials. The concept also showcases new removable rear seating, Fords advanced SYNC voice-activated in-car connectivity system and the latest Ford low-CO2 ECOnetic technology, including stop-start and regenerative braking. The concept is powered by an improved 153bhp version of Fords 2.2-litre Duratorq TDCi diesel engine. The range will eventually include 98bhp and 123bhp variants of the same engine. All versions will be paired with a six-speed manual transmission and feature front-wheel drive.